Governments have used the findings in many ways to develop policy and legislation that has had positive effects on the health of adolescents and young people. In Armenia, for example, the first national HBSC survey in 2005 identified in particular the issues of fighting (51% of 15-year-old boys reported having been in a fight), communication with fathers (48% of girls found it hard to talk to their fathers) and sexual and reproductive health (about half of the respondents had poor knowledge of HIV infection). Consequently, the Ministry of Education launched a Healthy Lifestyle curriculum-based programme in schools in 2008, which has been developed further to ensure that it focuses on improving young people's knowledge, behaviour and skills. The 2003 HBSC study revealed a considerable increase in regular alcohol consumption among young people in Germany, especially 15-year olds. The spike mirrored the growing popularity of "alcopops" in this age group since their introduction in the mid-1990s. In response, the Federal Ministry of Health pushed adoption of a national tax on alcopops, which came into force in July 2004. The measure dramatically increased the price of alcopops and enforced clear packaging that indicated that their sale to young people was prohibited. Tax revenues were targeted to fund alcohol prevention programmes. In 2006, the HBSC reported a dramatic decrease in alcohol consumption among young people, a trend that has been sustained. Prompted by data from the HBSC survey and other international research on the rise in soft-drink consumption among young people, the Latvian Parliament introduced an excise tax on sweetened drinks in 2004. Government efforts to improve young people's diets increased in 2006 when Latvia banned soft drinks, sweets and salty snacks in schools, despite corporate pressure. By limiting the availability of low-nutrient, energy-dense products in school cafeterias and vending machines, the Government dramatically curbed consumption of soft drinks by students. Following its success with soft drinks, the Latvian Government is now tackling energy drinks. A draft law that was approved by Parliament at its first reading will restrict sales to children and prevent the advertising and marketing of energy drinks to people under 18. Early sexual initiation has been declining in Scotland over the past 10 years, yet remains higher than in other parts of Europe. The aim of the proposed strategy to decrease pregnancy and parenthood in young people – the first with this focus in Scotland – is to increase the choices and opportunities available to support young people's well-being and prosperity throughout the life-course. The HBSC study team in Scotland was a key Government partner in identifying relevant data and trends to inform the strategy's development. The prevalence of multiple health complaints, such as headaches, feeling low, sleep difficulties and feeling irritated, doubled among young people in Sweden between 1986 and 2014, as documented by the HBSC survey. Researchers, policy-makers and community groups have taken steps to understand and address the reasons for this rise in psychosomatic symptoms. These include a study on mental health in schools in Sweden in 2009, in which data were collected from over 170 000 young people aged 12 and 15 years; Government investment in schools and health care systems to improve services for children and adolescents with mental health problems; and €30 million of public funds allocated in 2012 to research for promising interventions and to identify populations of young people who are particularly vulnerable to poor mental health. The WHO report Growing up unequal: gender and socioeconomic differences in young people's health and well-being covers 42 countries in Europe and North America. Results are analysed by 340 in-country researchers, supported and coordinated by the International Coordinating Centre at the University of St Andrews in Scotland and the Data Management Centre at the University of Bergen in Norway. 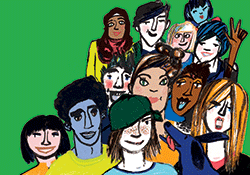 The cross-national survey covers diverse aspects of adolescent health and social behaviour, including self-assessment of mental health; obesity and body image; dietary habits; engagement in physical activity; support from families and peers; tobacco, alcohol and cannabis use; and bullying (see attached summary of key findings from the cross-national survey). The latest HBSC report, which presents data from the 2013 and 2014 surveys, has a special focus on the effects of gender and socioeconomic differences on the way that young people grow and develop.